Abstracts must be informative and structured, with section headings, as follows: Backgound, Methods, Results and Conclusions. 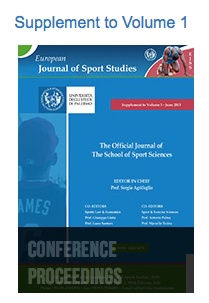 Full-length manuscripts may be submitted for publishing in the Baltic Journal of Sport and Health Sciences (BJSHS) (see the section "Call for Full Papers" below). Accepted authors should prepare their e-poster presentations in Power Point format (one single slide only) in landscape (horizontal) (see the e-Poster Sample). The image files need to be inserted into the poster by using the PowerPoint "Insert" function. No animated effects, animations or videos. e-Poster presentations must be in English. Full manuscripts should be submitted for consideration of publication by the 1st of April, 2016 and prepared according to the BJSHS guidelines for authors.